"There are a few categories of what I'm calling a mysto surfer here, but really is just a non-traditional shredder. A surfer who's a little different, dances to the beat of their own drum, but who rips super hard. Weird kooks don't really count. Like, you see this surfer take off on a wave and start their own brand of schralping, just see them jog to the water board in hand, and know they're on a whole different, weird level of good surfing." 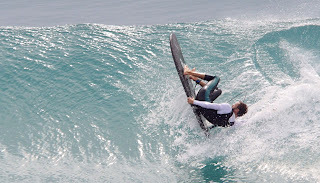 -- Dude who wears a hooded wetsuit all-year long, no matter what, never talks to anyone, shreds so hard. Mat surfers didn't make the cut. I guess that's not surprising. But by 2018, you'd think we'd at least make it out of the "weird kook" minor leagues and into "brand" status. Never heard mysto before. Your definition would vary based on your locale, but that list is just dumb. Overweight guy who shreds is a category? It's kind of a fun concept, though. Round here, I can only think of three - finless boards, mats, swimmers without fins or wetsuits. ps- happy the comments are working again. I'd love to see the video of how the guy in the photo got there and what happened next! The categories need updating. Come on SURFER!